Own daughter of Ronas Ryon, with Beduino and Dash for Cash on her bottom side. 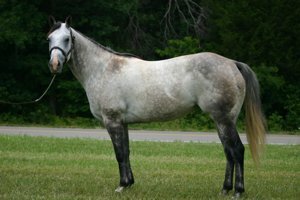 This big, beautiful, 2000 AQHA Appendix gray mare is willing, sound, and VERY SMART. 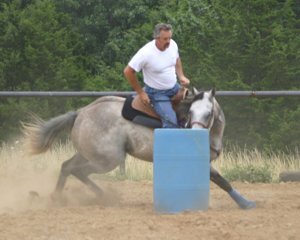 Well-started on barrels and patterned on poles, she is being hauled to local events for practice runs but needs seasoning. Trained and ridden by a professional, she stands to mount and is quiet at the gate, with no bad barrel habits. 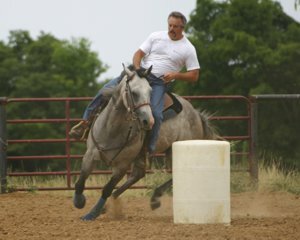 She loves to run the barrel pattern and literally hunts barrels, with plenty of power and athletic ability. Explosive speed on request, she needs a solid, experienced rider. Healthy, tough, good bone, deep chest, clean legs, black round feet, and unlimited potential. READY TO HAUL to finish seasoning and start competing. When you’re finished winning on her, she’ll be an awesome asset as a proven broodmare, having produced a beautiful 2005 gray filly (Chicklet) by Dashin is Easy.